Gist Chesterfield set to reduce environmental impact with new energy efficient refrigeration unit. Gist Chesterfield – the latest depot in our Temperature Controlled Logistics network – is now set to remove 117 tons of CO2 per year with the installation of a new environmentally friendly refrigeration unit. 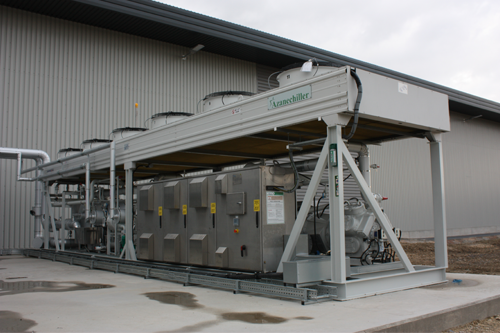 Manufactured by Star Refrigeration, the new state-of-the-art unit - Azanechiller 2.0 - reduces Gist’s environmental impact by using ammonia as a future-proof and natural refrigerant. The cooling system, the most efficient of its kind across Europe, lowers operational costs and reduces Gist’s environmental impact - exceeding the “Minimum Energy Efficiency Requirements” set by Europe’s Ecodesign Directive by 56%. In addition to this, ammonia has a zero Global Warming Potential ensuring Gist Chesterfield is protected from any future UK or EU environmental legislation that could be introduced. Alongside its environmental benefits, the unit utilises a revolutionary low-charge ammonia technology, reducing ammonia charge by up to 90% compared to other ammonia circulation pumps and therefore increasing the safety of the system. Sam de Beaux, Engineering Director at Gist, said “Star Refrigeration delivered above and beyond our expectations. We look forward to a long and fruitful relationship working with them in the future” Star Refrigeration has recently been shortlisted for the Environmental Initiative of the Year Award at the National ACR and Heat Pump Awards 2019, taking place on the 24th January.